As much as our clients’ backgrounds differ, their investment goals share a common theme: to invest wisely and expand their wealth for generations to come. Fulfilling our clients’ wishes – while respecting their rights to privacy and confidentiality – is our number one responsibility. We serve a broad base of clients, including successful entrepreneurs who are newly affluent and families with a long-standing wealthy heritage and complex financial needs. Our mission at Elite Wealth Management is twofold: to provide our clients with financial guidance based on their values and priorities, and to provide them the peace of mind and confidence to pursue their financial future – no matter what the markets or life may bring. Our capabilities are fully aligned to providing the best possible client service and communication along the way. We have extensive experience managing the wealth of high net worth individuals and institutions, and are committed to delivering insightful, informed advice to help our clients achieve their financial goals. At Elite Wealth Management, we seek to safeguard our clients’ financial position for the long term. Our objective is to provide liquid and tactically managed portfolios that can perform in varying economic conditions and to mitigate large swings in valuations. We think it is as valuable to not lose money when markets fall as it is to generate gains when markets rise. Superior risk-adjusted returns are sought under the principal that return matters as much as the amount of risk taken. Our objective approach, high ethical standards and unwavering commitment to provide the very best service that meets our clients’ unique needs are ingrained in the culture of our firm and the day-to-day operations. Clients are communicated with each step of the way and are informed of our rationale on an ongoing basis for every investment in their portfolio. Our clients deserve nothing less than a proactive partner who is vigilant in serving their interests. At Elite Wealth Management, we provide investment advice and cutting edge solutions that best meet the needs of the individuals, families and institutions whose assets we manage. By offering a full range of financial services and solutions, we provide comprehensive portfolio management, implement strategic planning, and utilize the expertise of our analysts to ensure our clients always have the upper hand. Ms. Fariba Ronnasi, president and founder of Elite Wealth Management, Inc. has headed the strategic management of numerous high net-worth individuals. 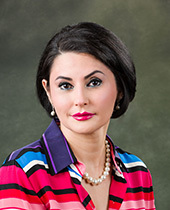 Prior to establishing the firm in October of 2004, Fariba worked as Managing Director for the Private Wealth Division of Columbia Management Company and was responsible for expanding the Private Portfolios Group on the West Coast. Previously, Fariba was a Business Development Manager for Citicorp in Private Banking Division. Prior to joining Citicorp, she worked as the Senior Private Banking Manager at Keycorp and established the Technology group for the Private Bank. She has 23 years of solid experience in the field of finance and investment management. Fariba received both her Bachelor’s and her Master’s degree from Seattle University in the field of Finance with a minor in Economics.